Three teenagers who died when their car crashed and burst into flames were killed by multiple injuries, an inquest has heard. 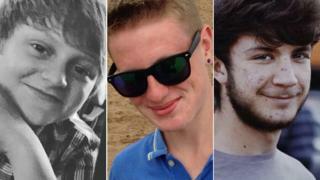 Farmhand Kyle Warren, 17, student Billy Hines, 16, and Dominic O'Neill, 18, who was unemployed, died on 5 April. Their black Ford Ka ploughed into trees on Tivetshall Road, near Pulham Market in Norfolk at about 23:50 BST. The inquest was opened at Norfolk Coroner's Court and adjourned until 25 July for a pre-inquest review hearing. The trio were travelling towards Pulham Market when the crash took place and they died at the scene. Norfolk's senior coroner Jacqueline Lake did not give details on who was driving the vehicle. Mr O'Neill lived in Pulham Market, Kyle lived in Harleston in Norfolk and Billy lived at Magpie Green, near Wortham in Suffolk. Their families have been paying tribute to them. Mr O'Neill's mother Davina said she had been overwhelmed with the support and love of his friends for her "beautiful, much loved... greatly missed" son. Kyle's family remembered a "very cheeky chappy, who always had a wonderful smile on his face", with a passion for banger racing and who was "outgoing and loved in return by all". Billy's family said he was "a funny, loving, caring, hard-working boy" who brought "so much joy to everyone he met" and enjoyed shooting, motorbikes and cars. They added: "It is testimony to Billy, Kyle and Dom to all the support we have had as a family."